This laminator from Royal Sovereign is an innovative machine you don't want to miss out on. Its narrow design and portability make this thermal roll laminator perfect for laminating and encapsulating individual and multiple copies of prints, signage, presentations, menus, or any other short document runs. The 380SL boasts a de-curling function that's ideal for high quality single-sided laminating, providing flatter output and a professional finish. Additionally, the 380SL features easy-to-use digital controls with 9 speed settings, a large film roll capacity (up to 7.9" roll diameter), and a laminating speed of up to 14.8 feet per minute. The RSH-380SL laminator fits perfectly in small working areas and will give a professional finish to all of your printed documents and projects up to 1/4" thick. Film Roll Diameter: Maximum 7.9"
Transcript: The material that we’re going to be running today has 1” core so we’re going to have change the adaptors to the 1” core adaptors from the ones that are supplied with the machine. These are the 2¼” adaptors. What we need to do is take our wrench, loosen up the adaptors by turning out these screws, and sliding this off. Next, we’ll put one of our adaptors on to the 1” core. The material that we’re going to be running today has 1” core so we’re going to have change the adaptors to the 1” core adaptors from the ones that are supplied with the machine. These are the 2¼” adaptors. What we need to do is take our wrench, loosen up the adaptors by turning out these screws, and sliding this off. Next, we’ll put one of our adaptors on to the 1” core. Put it down. Take a roll of film. Make sure that it’s going to come off the film so the adhesive on the film which is inside the roll here is going to come over the roller here and not touch the roller, just the polyester on the outside. That locks into there. You take one through the other side. Slide it in. I think that’s enough. And position it on the laminator. We’re also going to do the same thing on the bottom. Okay, now we need to web the laminator. First we take off the feed table. Okay. We’re going to take our film. Go underneath the idler bar. Take the safety cover, bring the film underneath, pull it out, and bring it over the two rollers. Now that we have the laminator on, it’s activating the film and the adhesive is melting. We’re going to take our bottom roll of film. It needs to go underneath the bottom idler. You want to make sure that our two rolls are lined up with each other. And then we’re going to take our film and fuse it to the top roll. Now we’re going to take our table, put it back in. Drop our safety cover. We want to make sure that our laminator right now is in the open, the rollers are open. We want to bring it to the lamination mode so the two rollers are together. And take our leader board, hit run on the laminator and we’re going to pull the film through the laminator. Make sure it goes between the two rollers in the back and out the other side. And trim the film off. Now you’re ready to laminate. The film that we’re running today, we’re going to be running 230 degrees at speed 3. We’re going to depress the run button so our film runs through the laminator. We’re going to take our images and feed them into the laminator. Once our prints are through, we’ll hit the stop button and we can remove our documents by taking our rear blade and cutting the material off. Here’s our laminated images. 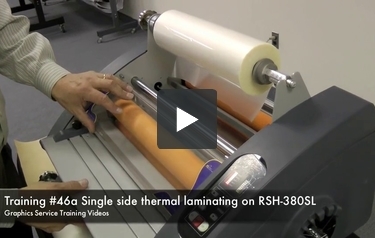 We will demonstrate how to do single slider lamination on your RSC-380SL laminator. For single sided, we’re going to remove our feed table. Take our film underneath the idler bar and then over the top roller. We place our feed table. Make sure the film does not go pass the net opening. Take a piece of craft paper or a thin material. Run it into the nip of the roller. Come to the back side. We want to run the craft paper underneath the idler roller, over top of the decurler, and then in between the back rollers, and out the back of the laminator like so. Then we come back to the front of the laminator. We want to marry this paper to the laminate, pull it taut, and close the nip of the rollers. Once we’re done webbing, we want to make sure we still have a little piece of paper feeding into the laminator. We’re going to take our first print, line it up where it needs to be, take our document guide, and line it up with the paper and the film. Now we’re going to hit the run button, feed our first print. There’s your final print using a decurler bar, and you can see how flat this is. If you’re in the market for a new roll laminator (or even your first one), a company you need to check out is Royal Sovereign. 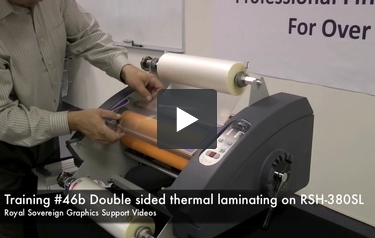 They make a lot of roll laminators that are worth your consideration, including the RSH-380. Here are this particular device’s strengths and weaknesses. The first good thing about the RSH-380 is its laminating width. It’s very wide, measuring a full 15 inches across. This makes it perfect for wider items, as well as the usual letter-sized documents (8.5” x 11”). The RSH-380 is compatible with all thicknesses of laminating film, from 1 to 10 mil. Your documents will be able to be super flexible or extremely stiff depending on your needs. The rolls of film you use can have cores that are either 1″, 2.25″, or 3″ wide. If you’ve ever wanted to work with mounting boards, you’ll get your chance if you use this device. It’s compatible with boards that are up to 0.24” thick. This laminator works pretty quickly once it warms up. (More on the warm-up time in a moment.) It can process 16.4 feet of material per minute so you’ll be able to laminate a lot of documents in almost no time at all. This is a remarkably easy machine to operate and you’ll be able to use it without any problems very quickly. There are nine preset speed settings that help make the device user-friendly so you’ll never have trouble choosing the right one for your project. There is a cross-cutter that’s been built directly into this laminator so you can easily get rid of any excess laminate. This also will help keep the device in great shape because you’ll be keeping sharp objects away from the rollers. 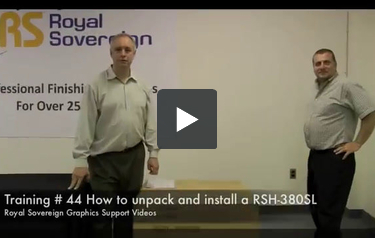 The RSH-380 comes with not one, but two warranties. The rollers are covered for six months while the rest of the machine has a year’s worth of protection. Perhaps the most disappointing thing about the RSH-380 is that it doesn’t have a cold setting. Thus, you probably shouldn’t try laminating certain items with it, such as photographs and documents printed with ink-jet ink. You should have a cold process machine available if you need to work with those kinds of items. It takes almost 10 minutes for this machine to warm up. This is one of the longest warm-up times for a laminator, unfortunately. This machine will take up a lot of room because its dimensions are 21.5″ (width) x 27″ (depth) x 24″ (height). Thus, it wouldn’t be a wise purchase if your workspace is already cramped. You’ll also need a dolly or someone to help you move it because it weighs 159 pounds. Despite its handful of weaknesses, the Royal Sovereign RSH-380 is definitely worth checking out. It will help you laminate a lot of documents quickly and its feed opening is wide enough for large items. Plus, it’s great that its compatible with so many types of laminating film. So if you need a roll laminator, be sure to consider the RSH-380.